It has been way, way too long since I made pudding cookies. It’s time to fix that problem. 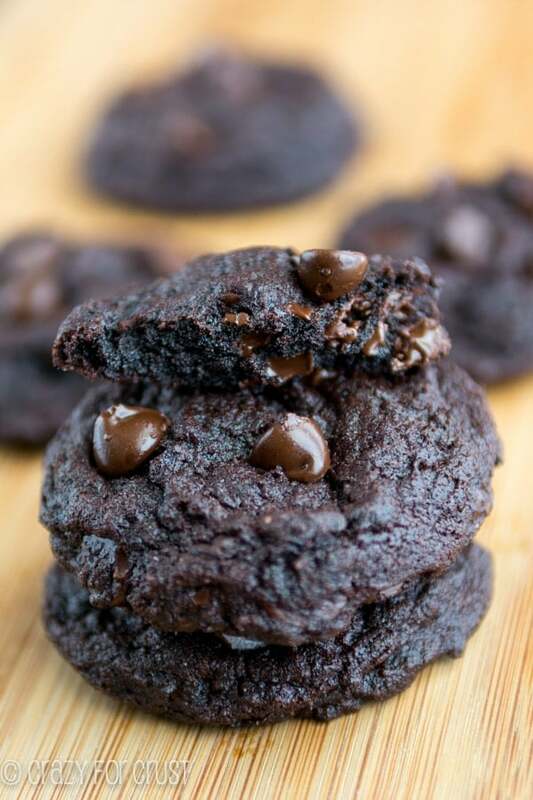 These Triple Dark Chocolate Pudding Cookies are, hands down, my favorite pudding cookie yet! So ohmigosh. I just had to delete the title picture because there was a hair in the photo. Bloggers, tell me I’m not alone in this? Can we ignore the fact I got all the way through editing and adding text without seeing it? Just an FYI, I do wear my hair up for baking and photo shoots. I have magical hair that falls off even when it’s up. I need a hairnet. Anyway, the hair was just on the plate not in the cookies, so the rest are safe. End gross alert. 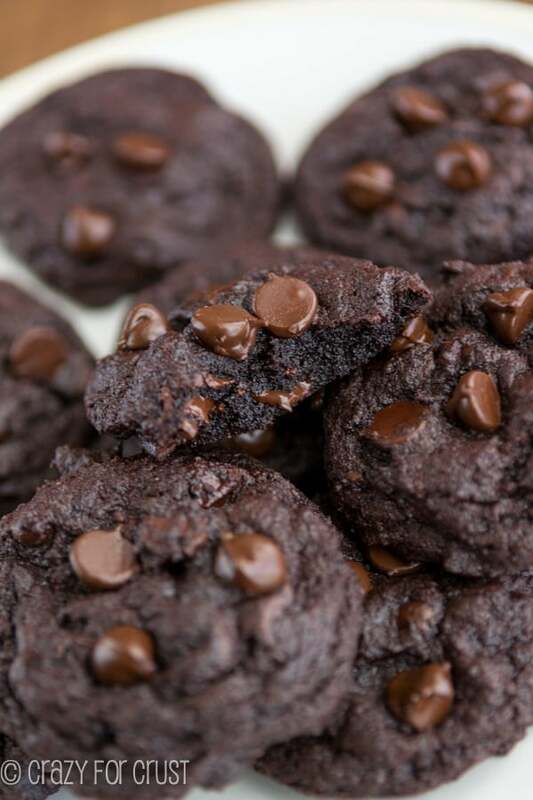 Let’s talk about the most amazing dark chocolate pudding cookies EVER, shall we? I used to make pudding cookies all the time. Then I stopped for some weird reason. I love pudding cookies – they’re my favorite! Lately my friend Averie has been a little obsessed with them and her obsession sparked mine. And here we are! For my re-entry into pudding cookie world, I decided to go dark – dark chocolate, that is. I never liked dark chocolate when I was a kid, but kind of like how my lemon love started a few years ago, my dark chocolate addiction is at an all-time high. Last weekend, when I was at Walmart, I saw the Hershey’s Special Dark Pudding Mix and Special Dark Chocolate Chips. They went right in my cart, and I knew immediately I was going to pair them with my Hershey’s Special Dark Cocoa Powder. Note: if you live outside the United States and are wondering what the heck pudding mix is, I’ve been told that Angel Delight is similar to it. It comes in lots of different flavors, just like pudding mix. Why add pudding mix to cookies? Two reasons. 1. It adds another layer of flavor. Depending on what cookie you’re making, you can add different flavors by adding pudding mix. Making a lemon cookie? Punch up the lemon flavor by adding lemon pudding mix. Same with vanilla and chocolate – it just intensifies the flavor. 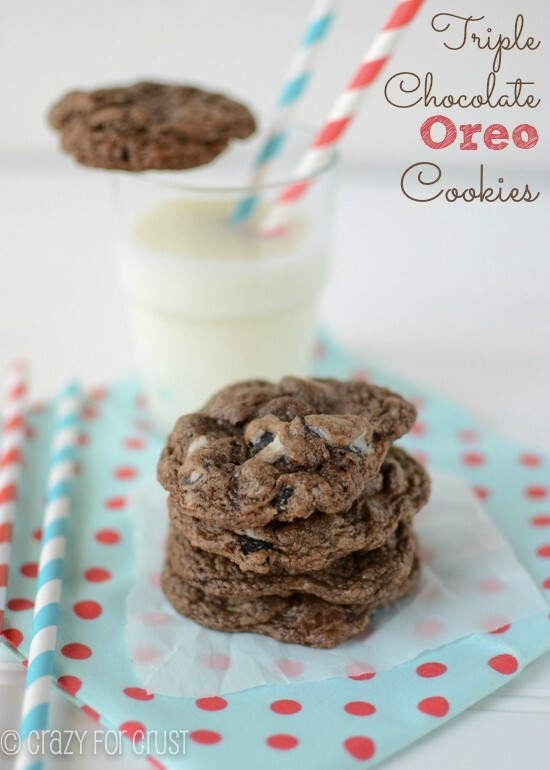 Want a touch of a different flavor to a cookie? Try adding banana, pistachio, cookies ‘n cream, or cheesecake pudding mix. It won’t be an overpowering flavor, but it’ll be there. That’s why I love adding the pudding mix – there are endless flavor combinations! 2. It makes them softer and keeps them soft. 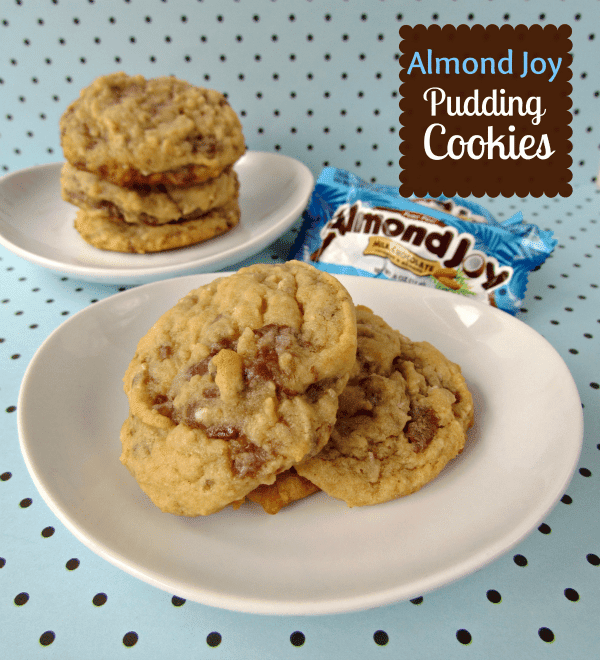 If you like a chewy on the outside and soft on the inside cookie, pudding cookies are perfect for you. These cookies are soft-batch cookies and they stay soft for days…if they last that long. My recipe gives that chewy texture at the first bite, like you expect from a cookie, but the inside is all soft and perfect. These cookies, because of the dark chocolate, almost taste like a brownie cookie! I found my Special Dark Chocolate pudding (and chocolate chips) at Walmart, but I think they sell it other places too. 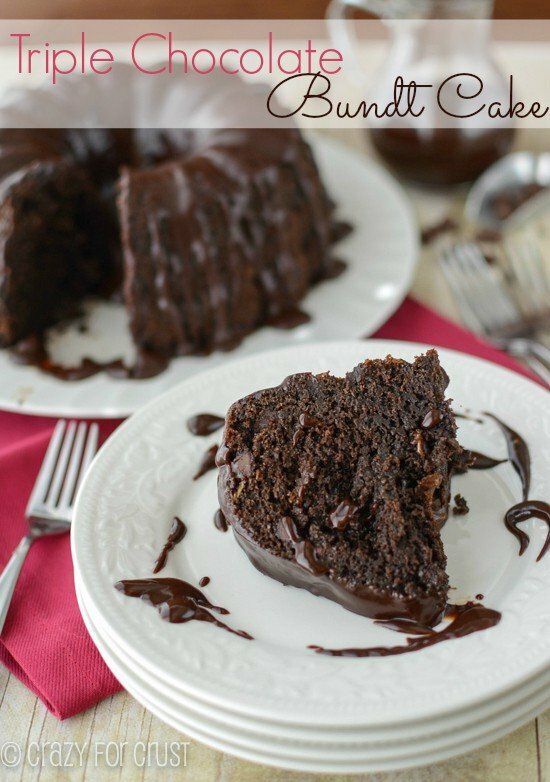 If you can’t find it, you can substitute chocolate or chocolate fudge pudding. 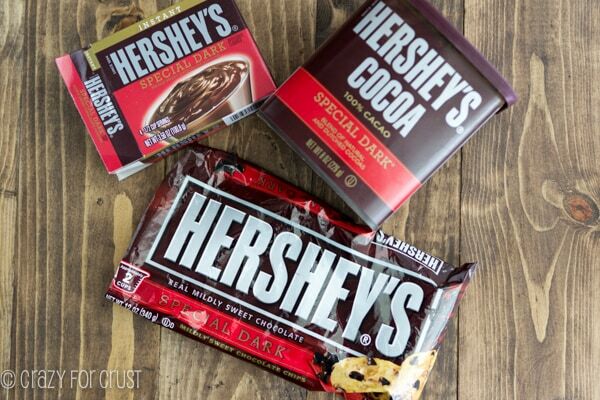 You can use any dark chocolate chip you like – the darker the better! If you aren’t a dark chocolate person, no problem. Substitute regular chocolate pudding, semi-sweet or milk chocolate chips, and regular unsweetened cocoa powder. They’ll still be triple chocolate, just more to your liking. To avoid the confusion, when you’re making pudding cookies you don’t make the pudding. You just add the powder to your batter. I use instant pudding, the small box (about 3.5 ounces). I have never used sugar-free pudding in my pudding cookie recipes so I personally don’t know how it behaves. Sugar-free pudding comes in smaller weight boxes (about 1 ounce each). I’ve had readers substitute 3 boxes to replicate the 3.5 ounces called for and their cookies failed. However, I have had reports of substituting one box of sugar-free pudding mix for my one box of regular with success. The point of my story: use sugar-free at your own risk (and then let me know how it went). When I’m baking cookies, I like to reserve some of the mix-ins (in this case, chocolate chips) and press some on the top of the dough. It makes them prettier after baking. This dough MUST be refrigerated. Don’t skip this step. Plan ahead! I like to scoop my balls of cookie dough right after mixing and place them on a wax paper lined cookie sheet. I cover it with plastic wrap and chill about 1-2 hours, then bake. The balls get nice and hard quicker than if you were to chill the whole bowl of cookie dough. Plus, it’s easier to scoop cookie dough warm than cold. Unless you’re building your biceps. The moral of the story? Make pudding cookies. You’ll love them. Why wait? Start today! And make them dark chocolate. Best. Cookies. Ever. I should know. I ate way too many! These Triple Dark Chocolate Pudding Cookies are filled with three kinds of dark chocolate for a real chocolate kick. The pudding adds another layer of flavor and keeps them soft for days, if they last that long! In the bowl of an electric mixer fitted with the paddle attachment, cream butter and both sugars. Mix in vanilla and egg until smooth. Mix in cocoa powder and pudding mix (just the powdery mix, not actual pudding). Beat in coffee or water, flour and baking soda until well blended. Stir in 1 1/4 cups of chocolate chips. Preheat oven to 350°F. Line cookie sheets with parchment or a silpat. Bake for 10-13 minutes, until the edges lose their sheen. I like these a little under-done, so I take them out when the center is still a tiny bit shiny. I made these tonight and they are amazing!! 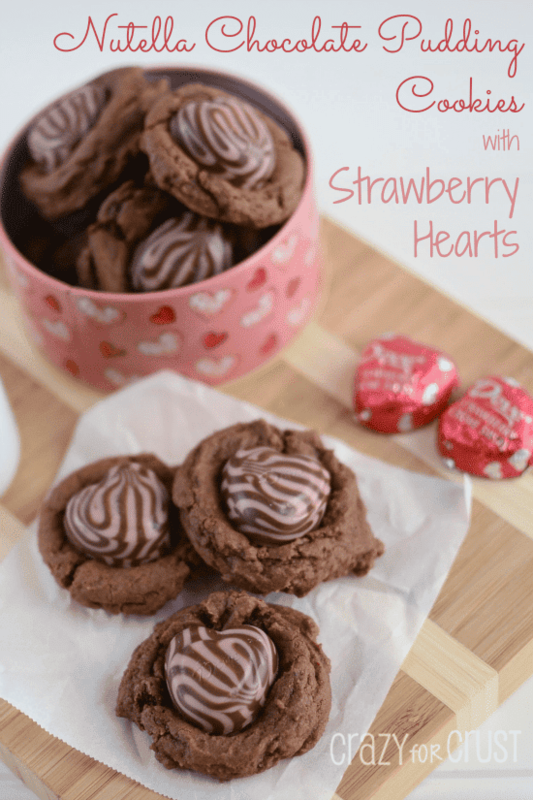 This is, hands down, my favorite cookie recipe! I just popped in so I can look at the recipe to make for the 1000th time! I made these today and ate way too much of the dough before it went in the oven. That was so wrong but so good. I still ended up with 26 cookies so mine must be small. I used a cookie scoop. I found this looking for a chocolate cookie recipe with coffee and almonds so I added almonds and used Godiva pudding and half black cocoa half Hersheys Dutch. I baked some without chilling and didn’t notice a difference. I roll mine into a ball off the scoop and they were perfect. Oh, and you don’t Amish people for black cocoa. It’s available online. Mmmmm chocolate! So I added a second tablespoon of brewed coffee cause I love coffee flavor. And I didn’t have choc pudding so I added cream cheese flavored pudding instead they were delicious!